The Cycling Embassy campaigns to publicise bicycle friendly systems that work in other countries, working with other like minded organisations to make our streets safer for all. Run entirely by volunteers, it aims to appeal to anyone who uses a cycle for transport, even if they do not regard themselves a "cyclists". The website has many functional features, including a Forum, a Wiki area for users to create and edit pages, and comprehensive document and page classification systems. 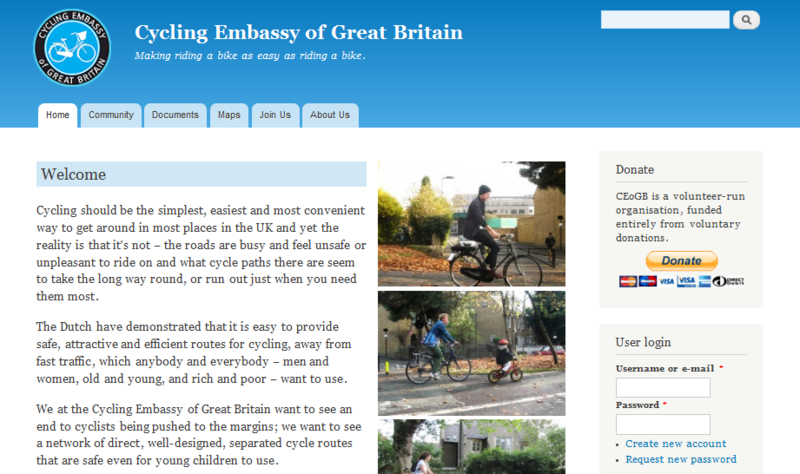 This site started life using Drupal 6, then was upgraded to use Drupal 7 in January 2012.